Segregation of our waste is essential as the amount of waste being generated today caused immense problem. There are certain items are not Bio Degradable but can be reused or recycled in fact it is believed that a larger portion of the waste can be recycled, a part of can be converted to compost, and only a smaller portion of it is real waste that has no use and has to be discarded. Household waste should be separated daily into different dustbins for the different categories of waste such as Wet & Dry Waste which should be disposed of separately. 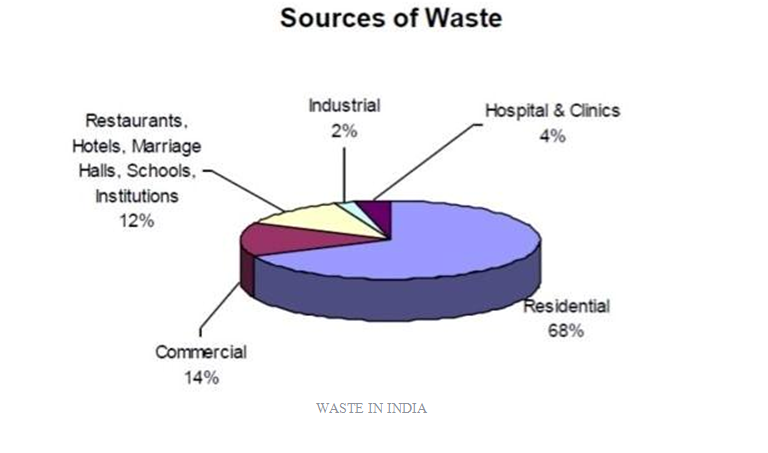 Wet wastes, which consist of leftover foodstuff, vegetables, peels etc. should be put in a organic waste converter -My Green Bin and compost can be used as manure in the garden. Dry waste consisting of cans, aluminum foils, plastics, metal, glass and paper could be recycled. One should also keep a dustbin for toxic wastes such as medicines, batteries, dried paints, old bulbs and dried shoe polish. If we do not dispose of the waste in a systematic manner than more than 1400 sq. km of land which the size of the city of Delhi would be required in the country by the year 2047 to dispose of it. Bio Degradable waste includes organic waste, e.g. kitchen waste, vegetables, fruits, flowers, leaves from the garden and paper. A – Recyclable Waste- Plastics, Paper, Glass, Metal Etc. B- Toxic Waste:- – Old Medicine, paints, Chemicals, bulbs, Spray Cans, fertilizer and pesticide containers, batteries, shoe polish. C- Soiled: – Hospital waste such as cloth soiled with blood and other body fluids. Toxic & soiled waste must be disposed of with utmost care. THE COLOR CODING OF WASTE BINS Organic is Green, Glass is Yellow, Paper is White, Metal is Grey, Plastic is Blue, Hazard is Red! All our Bio- Degradable waste can be composted with Aerobic Digestor- My Green Bin, This is hassle free, easy to use, environmentally sustainable and converted into Black Gold- Compost and Compost Tea a bio booster. One of the major problems that’s on rise in most of the urban cities is managing urban waste. 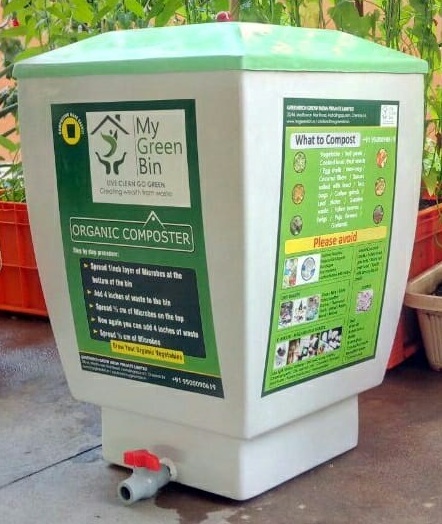 An urban Indian citizen generates nearly 700 grams of solid waste per person per day that is nearly 250 kg in a year and around 60 per cent of it is made up of organic matter. 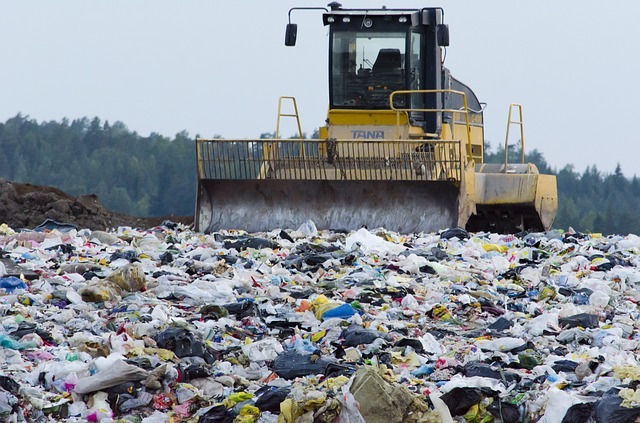 The precious wet waste that can potentially become black gold, remains unusable junk inside our landfills and in addition it releases harmful toxin gases due to anaerobic decomposition. By mixing this organic waste with the recyclable waste (paper, plastic, metal), we make even the recyclable waste less recoverable. The key to a clean, garbage free city lies in citizens who take up the responsibilities of source segregation and composting. So let’s get started with composting at home to do our part towards reducing the piling up of landfills that can be accomplished in very easy and simple steps.